Since ancient times, textiles, weaves and embroideries have been used in the service of God. In the modern world, you can surround yourself with uplifting Bible verses and comforting Bible scenes in your home or Church with Istok Church Supplies’ exclusive range of embroidery designs. Lovely and soul enriching embroidered Bible verses are perfect to provide the finishing touches to various items ranging from kitchen linen to altar cloths. Featuring writing in beautiful fonts, they can be used as Bible covers or framable works of art to adorn the interiors of your home. We do not provide frames with these items because we wish to give our customers freedom to select their own frames. Customers can customize their orders by opting from select background colors and sizes. Many of the embroidered Bible verses and Christian scenes we feature represent Orthodox Christian truths and spiritual beliefs. The exquisite detailing they feature make them collectible items that can be treasured for years to come. They are lovingly created by master craftsmen to bring glory to God and his teachings. Only the highest quality raw materials and practices go into the making of our exquisite embroidery pieces. We only use original German Madeira threads that are renowned the world over for their high quality. Our embroidered Bible verses are perfect gifts to give your friends and loved ones. They represent the love you hold in your heart for them and your desire to protect them with God’s mercy at all times. When your own words fail sometimes, they serve as a reminder of your best wishes and intentions. 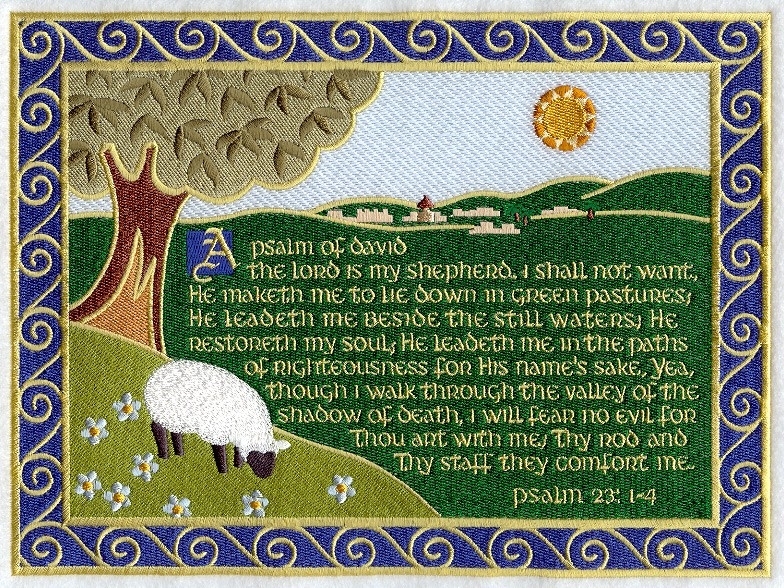 Whether you’re looking for an embroidered depiction of Psalm 23 or a soothing image of Lilies of the Field (Mathew 6:29), you will find it in our collection. So, go on and decorate your home as well as your soul with Christian verses and scenes that reverberate eternal truths.